These bags are filled by full automatic bag filling machines. There is a flap with one or 2 wicket holes according to customer’s specs. The bag opens by vacuum lifters and product is filled automatically. Then product is moved in the sealing position where after forming a gusset it is heat sealed. The one or two pairs of strings are on top of the bag inside top gusset. 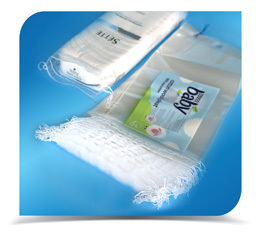 There is a perforation inside gusset so to facilitate the product taking from end user. Wicket bags are stacked and plastic bobbins inside wicket holes hold them together ready to be placed on the full automatic bag filling machine. Material: LDPE co-extruded with modified coefficient of friction in inner and outer layers , antistatic, and of high clarity. 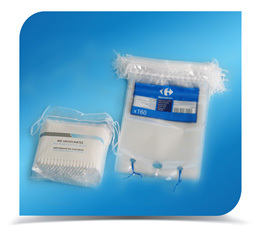 Other option “frosted” LDPE . 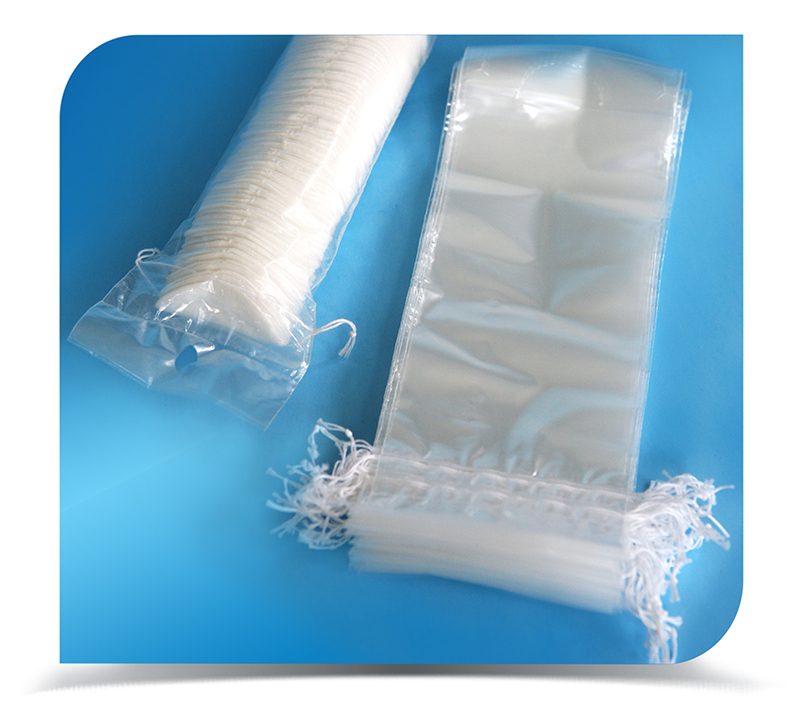 Transparent or white LDPE in thickness from 35 to 55 microns . Y shape ventilation holes so that air escapes easily during product filling. Slit in side seals near bag opening to prevent side seal opening. 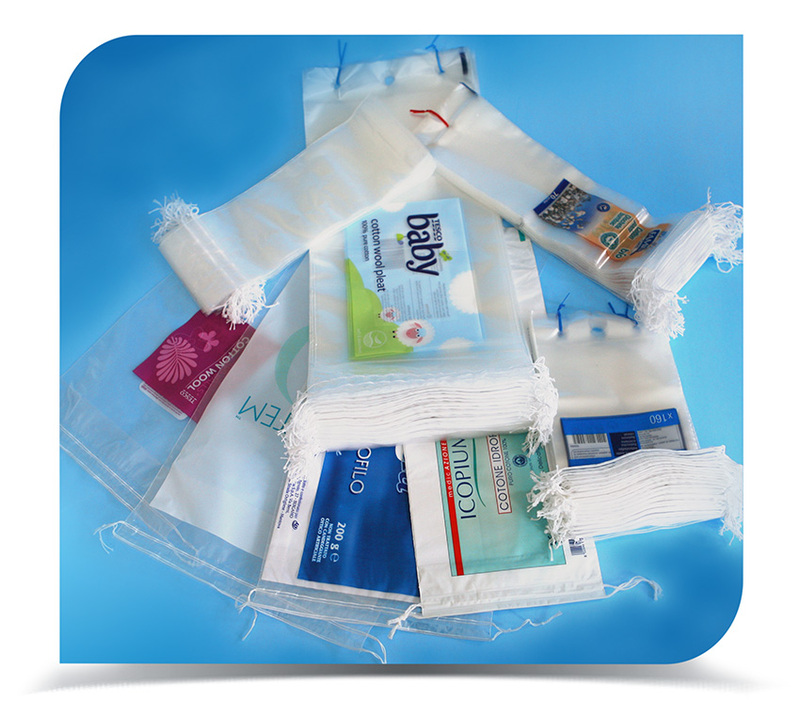 These bags are usually for manual filling of cotton pads. Usually there are 2 pairs of strings on top of the bag. Above top string there is an area of polyethylene so to make perforation and be able to seal the bag after pads filling. 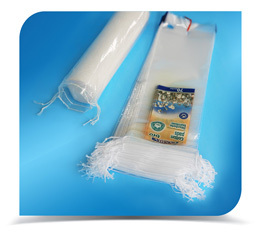 The end user tears off the polyethylene on the perforation line so to open the bag and recloses the bag by strings. We can produce these bags for automatic vertical filling cotton pads machines . In that case we place one round hole on top of perforation and we stack the bags by 50 on plastic bobbins. Material: LDPE co-extruded with modified coefficient of friction in inner and outer layers , antistatic, and high clarity. Transparent or white LDPE in thickness from 30 to 55 microns . One or two pairs of 100% bleached cotton strings white or colored . Y shape ventilation holes in bottom gusset so that air escapes easily during pads filling. Round or elliptic perforation on bottom gusset or half on bottom half on side.